This Baltimore Sun story shows how liberal “protective order” laws can give the relative you argue politics with during Thanksgiving Dinner the power to remove your constitutional rights and get you killed by the police. “A fight ensued over the gun,” said Sgt. Jacklyn Davis, a police spokeswoman. One of the officers struggled to take the gun from Willis, and during the struggle the gun fired but did not strike anyone, police said. At that point, the other officer fatally shot Willis, police said. Neither officer was injured, police said, and neither of their names was released. Davis said she did not know whether anyone else was in the home at the time, and she did not know who had sought the protective order against Willis. The “red flag” protective orders are officially known as emergency risk protection orders, and may be sought by family members, police or others to temporarily prohibit people’s access to firearms when they show signs that they are a danger to themselves or others. The law took effect Oct. 1. 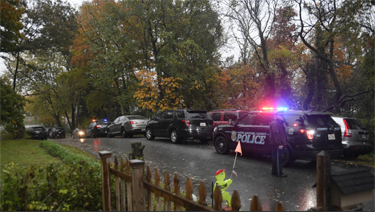 A spokeswoman for the Maryland Judiciary denied a request to see any and all requests for protection orders made at the residence on Linwood Avenue, citing the law, which states that anything related to an order is confidential unless the court rules otherwise. Police had come to the house Sunday night to speak with Willis, a longtime resident of the neighborhood, said Michele Willis, who was on the scene Monday morning and identified herself as his niece. She attributed that visit by police to “family being family” but declined to elaborate. She said one of her aunts requested the protective order to temporarily remove Willis’ guns. Michele Willis said she had grown up in the house and had been there Sunday night to move out her son, who had been helping to care for her grandmother. Her uncle, Gary Willis, lived in an apartment above the garage; she said other family members, including her grandmother, another uncle, two aunts and Gary Willis’ girlfriend were also at the home Sunday night. She said her uncle “likes to speak his mind,” but she described him as harmless. the Archives of Never Yet Melted in the 'Protective Order Laws' Category.